Mail call! This hand-painted, wooden mailbox set includes 6 pieces of mail and 6 removable hook and loop stamps, to mix and match again and again. 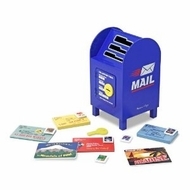 The mailbox features a locking door, key, and three mail sorting slots!